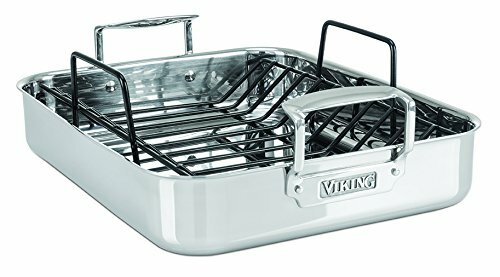 Viking designed this roasting pan with the home cook in mind by integrating several unique features. The unique inverted handles allow the roaster to fit into ovens with ease, minimizing space versus roasters with handles extended outward. The inverted handles also make the roaster ergonomically easier to put into and take out of the oven. The roaster can fit up to a 25 point bird and comes with a v-shaped, PFOA and PFOE free Eternal Non-Stick cooking rack. The elevated rack helps cook food quicker and more evenly. The 3-Ply Stainless Steel clad design combines three layers of metal to create one solid piece that is formed into the vessel. An induction capable stainless steel exterior is bonded to a layer of aluminum alloy and then finished with a final layer of high quality 18/10 stainless steel on the interior. The three-layer construction combines the durability of stainless with the superior conductivity of aluminum, delivering even heat distribution along the bottom and throughout the sides of the pan. Cooking surface is non-reactive and ideal for reducing sauces or liquids over a cooking surface. Dishwasher safe. Limited lifetime warranty. If you have any questions about this product by Viking Culinary, contact us by completing and submitting the form below. If you are looking for a specif part number, please include it with your message.